What Else Can I Expect From an Online Bachelor's in Legal Studies Program? Legal studies is an academic field designed for students who plan to enter careers in law, law enforcement, and criminal justice. This interdisciplinary field explores the historical impacts of laws and legal decisions, as well as contemporary trends and issues within the justice system. Legal studies draws on a wide range of social sciences, including criminal justice, history, political science, sociology, anthropology, and economics. Most degree programs in legal studies are exclusively offered at the undergraduate level, although enrollment numbers in this academic subject are relatively low; according to the National Center for Education Statistics (NCES), fewer than 1,800 bachelor's degrees in legal studies were conferred during the 2011-12 school year. Bachelor's degree in legal studies coursework includes foundational studies in law and ethics, criminal justice, criminal justice, and social sciences. Many bachelor's in legal studies programs culminate in a capstone course, and internships may be included in the curriculum, as well. Many of today's students choose to earn their bachelor's degree in legal studies online, rather than in a classroom. Web-based students follow the same rigorous curricula as their brick-and-mortar counterparts, leading to similar job opportunities after the degree requirements have been completed. The asynchronous (or self-paced) format of most online bachelor's in legal studies programs is also ideal for students with other commitments that may interfere with campus-based education, such as part-time employment or family obligations. Learn more about what you can do with an online bachelor's in legal studies and what kind of career opportunities you can look forward to with this comprehensive guide. Professionals with an online bachelor's in legal studies are prepared for many careers, including paralegal, court reporter, and arbitrator. Read more here..
A legal studies degree prepares students who seek careers in law, law enforcement, and criminal justice. Courses usually cover history, political science, sociology, anthropology, and economics. Read more here..
CAN YOU BECOME A TEACHER WITH A LEGAL STUDIES DEGREE? No. To teach legal studies or a related subject, students usually need a master's degree. Read more here..
WHAT IS THE HIGHEST DEGREE YOU CAN EARN IN LEGAL STUDIES? A few schools offer legal studies Ph.D. programs, but master's programs are much more common. Many students who earn this degree focus on a specific area of law when pursuing an advanced education. Read more here..
WHAT ARE THE LEGAL STUDIES? Most legal studies programs focus on law, law enforcement, and criminal justice. Read more here..
WILL AN ONLINE BACHELOR'S IN LEGAL STUDIES PROGRAM PROVIDE ME WITH THE SKILLS I NEED TO ADVANCE MY CAREER? A bachelor's degree in legal studies will equip students with the knowledge and skills needed to succeed in this demanding ― yet often rewarding ― professional field. The curriculum includes extensive studies in the legal and ethical policies guiding the U.S. justice system, as well as the laws and legal implications found in other countries. Additionally, coursework will introduce students to theories in sociology, economics, and political science that inform how laws are crafted, implemented, and enforced. WILL AN ONLINE BACHELOR'S IN LEGAL STUDIES PROGRAM WORK WITH MY SCHEDULE? Online bachelor's in legal studies programs offer a flexible, user-friendly alternative to traditional college education. Students can to download course lectures and readings, participate in virtual discussions with other students, submit written assignments, take exams and communicate with their professors ― all from the comfort of their home computer. Current technology also allows them to study on the go using a laptop, tablet, smartphone and other portable devices with Wi-Fi capabilities. WHAT JOBS CAN I GET WITH MY BACHELOR'S IN LEGAL STUDIES? A bachelor's in legal studies online will not be sufficient for students planning to become lawyers; a master's and doctoral law degree are required to practice in most U.S. states. However, the legal studies bachelor's degree may serve as a good stepping-stone toward advanced law studies. Common job titles for those who finish their legal studies education at the undergraduate level include paralegals and legal assistants, court clerks, court reporters, arbitrators, mediators, conciliators, and legal secretaries. WHAT ARE THE BEST ONLINE BACHELOR'S IN LEGAL STUDIES PROGRAMS? Choosing a program is an incredibly personal decision, and only you can properly evaluate whether a target school's strengths match your educational needs. 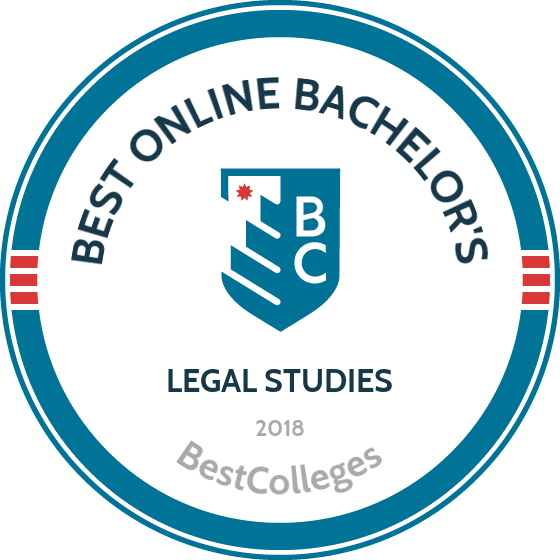 The following ranked list of schools should serve as a helpful starting point in your search for the best online bachelor's in legal studies programs in the United States. Our ranking is based on the courses schools offer, available specializations, student outcomes, career support services, and other criteria used to determine academic excellence. If you are considering an online bachelor's degree in legal studies, be sure to contact admissions specialists at different colleges and universities to learn more their about specific requirements and offerings. The University of Central Florida, based in Orlando, reaches distance learners nationwide, offering online bachelor’s, master’s, and doctorate degrees. UCF offers two nominal options for students seeking an online legal studies degree: a bachelor of arts and a bachelor of science, both with the same curriculum. The program’s core curriculum consists of 21 credits and includes studies in civil practice and procedure, legal writing, and property and real estate law. These programs conclude with a capstone experience. Faculty also assists students in seeking out internship and study abroad opportunities during the summer. UCF’s legal studies program does not include in-person requirements and delivers coursework asynchronously. To ensure online learners’ achievement, UCF pairs each student with a success coach, a mentor who works with the student from enrollment through graduation. Success coaches also help students decide what they want to do after finishing their legal studies degree online. Possible career options for graduates of UCF’s legal studies programs include working in a court, a law firm, the government, or a community service organization. As the program ultimately awards a completion degree, all students enrolled in UCF’s BA/BS in legal studies are transfer students. The university enrolls students in the fall, spring, and summer terms. In order to earn admission, applicants to the program must have earned a high school GPA of at least 2.0 and must submit either SAT or ACT scores. As UCF is a state school that prides itself on its service to the Sunshine State, out-of-state students pay higher tuition rates than Florida residents. Since students earn a completion degree and enter UCF with differing amounts of credits, program completion times vary. The University of Central Florida has earned regional accreditation from the Southern Association of Colleges and Schools Commission on Colleges. Brandman, situated in Irvine, California, prides itself on being a military-friendly institution that excels at providing the educational needs of working professionals. The university offers a range of self-paced online degrees with year-round sessions, including its 120-credit bachelor of arts in legal studies. This program provides students with a comprehensive understanding of the legal system in a democratic society. Faculty have also developed courses according to the school's signature Brandman iDEAL (Instructional Design for Engaged Adult Learning) model, which promises online students the same quality and rigorous education that students receive on campus. Areas of study in the program's 33-credit core include white-collar crime, torts, litigation and trial advocacy, and a legal studies capstone course. As students dissect Supreme Court decisions in this online bachelor's degree in legal studies, they examine topics like the correctional systems, conflict resolution, and forensic psychology. Within the program, Brandman offers a 12-credit paralegal concentration, in which students study contemporary legal studies, law practice management, and electronic discovery and legal technology. As well as a minor in legal studies, the school makes available a paralegal profession concentration for students interested in a paralegal studies degree. Brandman's faculty delivers online coursework through Blackboard, with which students also access course-specific resources. The school also makes a variety of resources available to assist with online learning, such as a virtual library and bookstore and free online writing and math tutoring services. Admission requirements for Brandman's online legal studies degree include a minimum of 12 transferable baccalaureate credits and official transcripts from all colleges previously attended. Students may only transfer credits from regionally accredited institutions and Brandman University itself is regionally accredited by the WASC Senior College and University Commission. Approximately 20% of Brandman’s students serve or previously served in the military, for which the university compensates with special course transfer opportunities and discounted tuition rates. For all other students, tuition is the same regardless of location. National University, a private, four-year college located in La Jolla, California, offers an online legal studies degree for students hoping to gain the systematic, critical-thinking, and verbal skills needed for a variety of careers, and potentially law school. The bachelor of arts in pre-law studies is a great option for those learners who want a degree that transfers to many different types of analytical roles. NU uses a quarter-credit system. Distance learners must earn 180 credits - 76.5 of which must be taken in the upper-division level of the curriculum. New students must take a few prerequisites. These include college English I and II and at at least three of the following: intro to psychology, American politics, intro to philosophy, or intro to law and legal writing. The major itself is comprised of 40.5 credits, and electives count for 31.5 additional credits. The remainder are devoted to general education studies. Legal studies courses include legal aspects of business, the art of negotiation, issues in conflict management, and analytical reasoning. Learners have two options to complete the senior project requirement. The first is called advocacy and requires students to create trial briefs, write discovery strategies, provide oral arguments, and examine/cross-examine witnesses during a mock trial. The second option requires them to research and write a paper that is equivalent to an appellate brief. Graduates have gone on to work in politics, financial planning, banking, law firm administration, teaching, copyright law, legal publishing, and higher education administration. Liberty University offers its students -- including 94,000 distance learners -- an academically rigorous education rooted in Christian principles. Liberty is the largest college in Virginia and the largest Christian university in the world, but with a 17:1 student-to-faculty ratio, learners won’t get lost in the crowd. The school offers more than 500 degrees, many of which are available fully online. Liberty's online programs boast some of the most affordable tuition rates among the nation's online schools. Students can also take advantage of flexible payment plans, scholarship opportunities, and credit for prior learning and military experience. Military students benefit from reduced tuition, and in-state and out-of-state students pay the same rate. One entirely online program is the 120-credit bachelor of science in government with a pre-law concentration. This unique program emphasizes ethical interpretation of the law and the development of students’ biblical worldview. Through the pre-law concentration, students are prepared for further study in the field. Alongside their studies, students benefit from access to resources such as Liberty Landing (an online student community), webinars and tutorials, ministry tools, and an online writing center. The curriculum of Liberty's online legal studies degree covers the judicial process, criminal law, constitutional law, persuasive argumentation, and jurisprudence, among other subjects. Requirements for degree completion are 39 to 42 hours of general education, including Christian life and thought, and a major, which comprises 15 hours of core classes and 33 hours of concentration. The program generally takes four years to complete. Aside from general education requirements, students must take 24 credits of the major and concentration through Liberty (learners can transfer other credits from regionally and nationally accredited institutions if eligible). Transferring in more than 45 credits will also waive Christian life and thought competency requirements. To apply to the online bachelor’s degree in legal studies, students must have a 2.0 cumulative GPA or higher from high school and all accredited universities attended. Liberty programs have several acceptance deadlines per year for flexibility in start date. Since its founding in 1966, Bellevue has educated working professionals through curricula that integrate academic rigor with flexibility and hands-on learning. The school is based in Nebraska, but serves students at 15 other locations and online. Bellevue delivers 70 undergraduate and graduate programs to 10,000 students each year. The university's online bachelor's of science in legal studies is a 127-credit program designed for students preparing for a range of careers in the public and private sectors or seeking entrance into graduate school. A standout among accredited online legal studies degrees, this is an accelerated program that interweaves theoretical concepts in law with their real-world applications. The program also integrates political science, economics, public administration, finance, accounting, and management. Areas of study in the 40-credit major include the theory and practice of law, the criminal and civil legal systems, constitutional law, and legal research and writing. Along with major requirements, students must complete nine credits in the school's unique Kirkpatrick Signature Series, which focuses on successful institutions and traditions grounded in Western culture. This distinct three-course series entails American vision and values, tradition and change, and freedom and responsibility. The remaining 78 credits in the online bachelor’s degree in legal studies involve general education and electives. Enrolled students benefit from the opportunity to attend online guest lectures, and to visit law schools, legislative sessions, and shareholders meetings provided by recognized experts and legal professionals. Seasoned faculty draw from real-world knowledge in the field. In addition to programmatic support, the university provides writing and tutoring services, career services, and interactive math and science labs. To be eligible for admission, applicants must have at least 60 credits or an associate degree from an accredited institution with a grade of C or above. Tuition and fees are the same in-class or online, and Bellevue also offers military-exclusive tuition rates. One of the largest universities in the nation in terms of student enrollment, Arizona State is also a powerhouse in distance education. The university offers over 100 online undergraduate, graduate, and certificate programs in fields like biomimicry and social entrepreneurship. One of ASU’s best online undergraduate offerings is the bachelor of science degree in justice studies. Requiring the traditional 120 credits, ASU’s justice studies program offers students the chance to earn a four-year legal studies degree entirely online. The curriculum’s core program includes studies in justice theory, justice research, and statistical analysis for justice studies. As such, the program has a significant quantitative orientation, which differs from most standard legal studies degrees. Because of that orientation, the program’s most typical post-graduate careers differ from those of other legal studies programs and include academia, community health work, and intelligence. ASU delivers all program coursework asynchronously. Additionally, the curriculum does not require any in-person commitments. ASU’s admission requirements for freshmen are extensive. First-time applicants must meet one of three benchmarks: placement in the top 25% of their high school graduating class, a 3.0 GPA, or a 24 on the ACT or a 1110 on the SAT (22 and 1040, respectively, for Arizona residents). Transfer applicants must have earned at least 24 college credits with a minimum GPA of 2.5. Transfer students who have not yet earned 24 credits must also meet freshman admission requirements. Although ASU has slightly more lenient admissions standards for Arizona residents, all students enrolled in the online justice studies program pay the same tuition rate no matter where they call home. ASU is regionally accredited by the North Central Association of Schools and Colleges Higher Learning Commission. For more than 70 years, UMUC has dedicated itself to providing working professionals with the flexible academic programs they need to advance their education and career. The university delivers more than 90 degrees, specializations, and certifications in a range of disciplines, each with multiple start dates per semester and all designed to fit busy lifestyles. UMUC is regionally accredited by the Middle States Commission on Higher Education. UMUC's bachelor of science in legal studies is available entirely online. In addition, there is a workplace learning course option. The program produces professionals versed in legal analysis, legal research, and legal document drafting. The school designed its accredited online legal studies degree curriculum — with input from scholars, employers, and experts — to provide students with an in-depth understanding of theoretical concepts through the lens of real-world application. Core courses broadly examine processes of institutions in the American legal system, the role of the paralegal, and legal ethics. Specific areas of study in the major include legal research and writing, criminal law and procedures, litigation, contract law, domestic relations, estates and probate, workers’ compensation, administrative law, and torts. Forty-six credits of minor and/or elective coursework are required; forty-one credits of general education are required. Students can also expect extensive support services including academic advising, writing assistance, resume writing and career planning advice, and honor societies. The school also features a Veterans Resource Center that provides assistance in adjusting to civilian life. Students can transfer up to 90 credits from other colleges and universities, and up to 70 credits from community colleges, toward the UMUC's online bachelor’s degree in legal studies program (30 must be taken at the school). Additionally, the university provides reduced tuition rates for its 50,000-plus military students, their dependents, and federal employees. Peirce College, founded in Philadelphia in the mid-19th century, began as a business school that primarily catered to veterans returning home from the Civil War. Today, Peirce has expanded its offerings to working adults beyond business and now awards degrees in information technology, health, organizational leadership, and legal studies. Peirce’s online bachelor of science degree in legal studies stays true to the college’s roots, as it includes a business concentration. Courses occur asynchronously with no in-person requirements, covering topics like foundational studies in both business and law. Courses include macro and microeconomics, business litigation, contract law, and human resources management. The program also includes a capstone that directly applies legal studies to business. This program prepares students for employment in business and legal settings or in positions at the intersection of the two (i.e. compliance, regulation, or human resources). Many graduates of the program also continue on to law or business school. Unlike some comparable online legal studies programs, Peirce awards a completion degree, and all applicants to the program must have already completed 45 college credits. As such, the program is shorter than those awarding typical 120-credit, four-year degrees, and program completion takes anywhere from one to three years. Students who finish in one year are generally transfers who have already completed 90 college credits, the maximum number Peirce allows for a transfer. As a private college, Peirce charges the same tuition to all students enrolled in an online program. The college has garnered regional accreditation from the Middle States Commission on Higher Education. Serving students at locations throughout Florida and online, Keiser’s distance learning format incorporates a key tenet of the the institution's mission: hands-on learning in small class environments. The university's bachelor of arts in legal studies prepares students for various careers in legal and law-related fields, as well as for entry into law school. This accredited online legal studies degree covers a variety of subject areas, including family law, civil litigation, legal interviewing and investigation, and immigration law. Students also take courses in management information systems, critical thinking, and workforce diversity. The curriculum is divided into lower and upper division major and general education courses, and culminates in a legal studies capstone project. Students must complete all lower division courses before moving on to the upper division. To graduate, learners must complete 120 credits in total. Keiser provides a full suite of financial aid options, including scholarships and grants based on financial and academic criteria. About 81% of students enrolled at the Fort Lauderdale campus receive federal financial aid (and in terms of tuition and fees, all distance learners are charged the same per semester whether in or out of state). The university also offers resources to assist students outside of the virtual classroom, including resume writing, interview coaching, professional development support, and access to the school's online career center. Keiser requires no prerequisites for major courses of the online legal studies degree. To apply, students must simply provide GED scores and proof of high school graduation. Students may transfer credits from regionally accredited institutions (or non-regionally accredited if the course or degree is similar in content) as long as they complete the final 25% of the program at Keiser. Based out of New Orleans, Tulane University has a well-earned reputation as the best university in Louisiana. Originally founded over 130 years ago, Tulane’s continuing education school has since reopened and rebranded as SoPA in April 2017. Students nationwide can access the programs that Tulane’s School of Professional Advancement (SoPA) offers, all of which utilize asynchronous learning without in-person requirements. Tulane’s bachelor of arts degree in general legal studies -- which includes a concentration in paralegal studies -- is one of SoPA’s new programs worth investigating for anyone hoping to earn an affordable online law degree. Tulane’s bachelor degree legal studies curriculum includes the standard 120 credits and usually takes four years to complete. The program’s core curriculum includes studies in litigation, legal writing, and computers in the law firm. In their final semester, all students complete a 100 hour paralegal practicum. As a general education requirement, students must also complete a course in public speaking. The program’s curriculum has earned approval from the American Bar Association Standing Committee on Paralegals. In addition, since a legal studies degree is somewhat broad, graduates can also find work as office managers, court clerks, and human resource managers. Many graduates continue on to law school, as the curriculum includes general background in legal practices and concepts and the court system. SoPA aims to cater to as many adult, working students as possible. As a result, there are no GRE or minimum GPA requirements for admission. In addition, each student pays the same tuition rate upon acceptance, even if they live outside Louisiana. Tulane University is regionally accredited by the Southern Association of Colleges and Schools Commission on Colleges. Named for its location just outside of Wilmington -- the city with the largest population in Delaware -- Wilmington University is a relatively young school that will celebrate its 50th anniversary in 2018. Wilmington now offers many programs to distance learners, including the bachelor of science in legal studies, offered in accelerated, online, and hybrid formats. No matter what format they choose, online students must complete at least 10 credits of the legal studies core curriculum face-to-face. Students can opt for on-campus or blended learning to complete this requirement. This legal studies curriculum includes a mandatory interdisciplinary concentration that offers studies in American history and public policy. The legal studies core includes coursework in civil procedure, legal research, and advanced litigation skills, preparing graduates for careers as paralegals or legal assistants. Students must also complete a capstone -- called Virtual Experience in Legal Studies” -- in which they enter a simulated law office and practice functioning in the workspace. Wilmington delivers all program coursework asynchronously. The program’s 120 credit curriculum usually takes students four years to complete. Students who excel in their coursework can earn recommendation for admission to Lambda Epsilon Chi, the paralegal student honor society. In addition, students in the program who earn a 3.5 GPA and a satisfactory LSAT score can earn automatic admission to Widener University Delaware Law School. Wilmington University is a private school, and all online students pay the same tuition regardless of where they live. Transfer students may bring up to 21 legal studies-related credits with them if they previously attended another program approved by the American Bar Association. Students who did not attend an ABA-approved school can apply nine legal studies-related credits. A member of the University of Massachusetts system, the Lowell campus is the second largest branch, trailing only the flagship campus in Amherst in terms of student population. In recent years, UMass Lowell has begun offering selected degrees online and asynchronously through the Blackboard platform. One such degree is the online bachelor of liberal arts, which includes nine available concentrations. The liberal arts program benefits working professionals, transfer students, and students who previously experienced an interruption or gap in their education. No matter their situation, students interested in pursuing their legal studies degree online at UMass Lowell can do so by choosing the legal studies concentration. The legal studies concentration extends the liberal arts survey approach, aiming to familiarize students with as many different legal branches as possible. As such, coursework in the concentration includes studies in business law, corporate and property law, real estate law, and cyberspace law. The program does not include a capstone or thesis requirement. In total, the curriculum consists of 120-122 credits, depending on courses, and usually takes students four years to complete. As UMass Lowell’s legal studies program actually awards a liberal arts degree, students must also complete a second concentration, such as art history, economics, English, gender studies, history, philosophy, political science, and psychology. UMass Lowell does not list minimum GPA or work experience requirements for admission. However, all applicants to the liberal arts/legal studies program must submit either SAT or ACT scores. Although UMass Lowell is a state school, online students pay the same per-credit tuition as Massachusetts residents. UMass Lowell is regionally accredited by the New England Association of Schools and Colleges. Hodges has campuses in Naples and Fort Myers, Florida, along with an expansive online learning platform, which includes an online legal studies degree. The program focuses on the intersection of the words of law and technology, and students spend time studying eDiscovery and eLitigation, how to properly manage emails and electronically stored information, and the privacy issues surrounding these topics. Security is at the forefront of Hodges’ curriculum, and students can expect to graduate with knowledge of the role that security plays in the legal system. Hodges’ degree is open to students of many different backgrounds, including first-time freshman who want to pursue a law degree, individuals already working in the field who want a four-year education, or career changers. The BS in legal studies requires 120 credits, 48 of which are devoted to studies in torts, contracts, criminal law and procedure, current legal issues, and other similar topics. Students have the opportunity to take 40 credits of electives, which further specialize their knowledge. Students who want to graduate quickly can take advantage of the school’s accelerated program. The university is focused on ensuring that every student receives a personalized educational experience taught by top-tier faculty. The school's student-to-faculty ratio is 14:1, and every professor holds a juris doctor degree. Based in the city of River Forest, Illinois, Dominican University is an affiliate of the Sinsiniawa Dominican Sisters and offers programs in arts and sciences, social work, business, education, and library/information sciences. The university operates a primarily-online school for professional and continuing studies, which offers an online bachelor of arts in legal studies (BLS) program. Requiring the standard total of 120 credits, Dominican’s online legal studies degree is an accelerated program, as students complete two full-time years of study in 20 months. As such, Dominican’s BLS program awards a completion degree, and all applicants to the program must have already completed an associate degree. Dominican’s BLS curriculum strives for interdisciplinarity, offering economic, philosophical, theological, and historical perspectives on the law. Students are able to hone in on a pre-professional area by choosing between concentrations in criminal justice, disability advocacy, labor relations, law and social justice, paralegal studies, public administration, or sustainability studies. No matter their concentration, all students must complete major coursework in areas, such as contracts, religion and the law, and legal ethics. All students have the option of completing a for-credit internship in a law office at the conclusion of their studies. Students who opt for the paralegal studies concentration can pursue parallel certification from The National Federation of Paralegal Associations, The National Association of Legal Assistants, and The National Association of Legal Secretaries throughout their studies. An associate degree is the only listed prerequisite for admission to the program. Once accepted, all students pay the same tuition, as Dominican is a private university. The program delivers coursework asynchronously, allowing working adults maximum flexibility in earning their degree. Dominican University is regionally accredited by the Higher Learning Commission. Originally founded in the 19th century to prepare women for the workforce and equip them with a liberal arts education, Mississippi University for Women has since diversified, now offering undergraduate and graduate programs. The university’s most popular programs are nnursing, business administration, and public health education, though MUW offers programs in many other fields. Admitting men since 1982, MUW maintains its historic commitment to academic and leadership development for women. The bachelor of arts or bachelor of science in legal studies degrees at MUW are mostly online with the exception of 10 hours of traditional face-to-face instruction. Each program requires a total of 124 credits, takes four years, and delivers coursework asynchronously. Both curricula are identical and opt for a liberal arts approach to the discipline. Courses are generally survey classes, including studies in real estate law, criminal law, family law, and bankruptcy law. The bachelor of arts or bachelor of science in legal studies degrees at MUW are mostly online with the exception of 10 hours of traditional face-to-face instruction. The program prepares graduates as legal professionals with skill sets that will transfer to many different career tracks. Even in online courses, MUW stays true to its liberal arts roots by keeping class sizes small. The program is one of only two legal studies degrees in Mississippi to earn the American Bar Association’s seal of approval. In order to obtain admission into the program, applicants must have earned a GPA of at least 2.0 in high school and must submit either SAT or ACT scores. MUW has earned regional accreditation from the Southern Association of Colleges and Schools Commission on Colleges. Requirements for earning a legal studies degree online can differ considerably between schools and programs. Along with core coursework, some colleges offer academic concentrations that allow students to develop specialized knowledge and skills as they earn their bachelor's in legal studies. Legal research: Providing instruction in persuasive writing and researching legal matters, this course is fundamental for anyone pursuing a career in law. Along with major analytical methods used by lawyers, students will learn to create arguments and reach conclusions by examining information gathered through research. Legal writing: This course offers an introduction to the writing style and vocabulary frequently used by lawyers and paralegals in official documents. Students develop a solid foundation in legal terms and a concise writing style as they learn to produce memos, briefs, and contracts. Civil litigation: Ideal for those interested in entering a pre-law or paralegal program, introductory civil litigation courses provide a broad overview of the litigation process. Lessons address types of courts and courtroom procedures, lawsuit initiation, and the various categories of legal disputes. Students also learn about alternatives to litigation, such as arbitration. HOW LONG DOES IT TAKE TO GET AN ONLINE BACHELOR'S IN LEGAL STUDIES? Online legal studies degree programs can vary drastically in length. While some may be completed in only two years, others take four or more years to finish. A graduate program's length depends heavily on whether coursework is asynchronously-paced or delivered in a synchronous, cohort format. Individually-paced programs allow students to review course materials and complete assignments at their leisure, without the requirement of being online at scheduled times. Offering flexible deadlines, asynchronous programs are ideal for students who balance coursework with employment or family obligations. Conversely, students in cohort-based programs study as part of an online group. They may be required to participate in scheduled group activities or discussion sessions, and are often held to stricter deadlines. Though less flexible than asynchronous programs, many learners prefer the more intimate format of cohort learning due to its emphasis on student-faculty relationships and academic accountability. Like other undergraduate programs, a bachelor's in legal studies will usually be divided between major coursework (also known as core coursework) and general education requirements that all four-year students must fulfill. For core coursework, students can expect modules like 'American Politics', 'Research Methods for Criminal Justice', 'Judicial Administration', 'Juvenile Justice', 'Civil Litigation', 'Real Property Law', and 'Paralegal Studies', as well as introductory courses in sociology, anthropology, psychology, history, political science, and economics. Most schools offer 'legal studies' as a specialized concentration for criminal justice bachelor's programs, but dedicated bachelor's degrees in legal studies are available at some colleges and universities. For capstone courses, students will be required to craft a comprehensive research project that addresses a contemporary legal pattern or concern. Internships are often available as optional electives. These onsite sessions allow students to receive supervised training from qualified professionals and gain experience working in law enforcement stations, law offices, courts, and other real-world legal settings. It's crucial to research the accreditation status of an MBA program before fully committing to it. In the U.S., most online master's programs in economics do not receive programmatic accreditation; exceptions are usually business administration degree programs with an economics focus, which may receive accreditation from the American Bar Association, Council of the Section of Legal Education and Admissions to the Bar. However, students should make sure that their college or university has received regional or national accreditation before committing to it. The best online bachelor's in legal studies programs are offered by accredited institutions. An accredited school is one that meets or exceeds the academic standards defined by a quality assurance organization such as the Council for Higher Education Accreditation. Only schools accredited by recognized institutions are eligible to receive federal financial aid. Institutions may be regionally or nationally accredited, depending on the bodies by which they are assessed. Understanding the distinction between regionally and nationally accredited schools is important when choosing a legal studies degree program. Regionally accredited institutions are typically nonprofit, academically-focused schools, while for-profit vocational schools are usually nationally accredited. Credits earned at regionally accredited institutions transfer easily to other schools and graduate programs. If you're earning an online bachelor's in legal studies with the intent to enter a master's or pre-law program, it's important to select a regionally accredited institution. Although the U.S. Department of Education doesn't accredit schools itself, this branch of the government oversees the distribution of federal financial aid to institutions that meet accreditors' standards. In turn, quality assurance groups such as the Council for Higher Education Accreditation ensure that accrediting agencies adhere to certain guidelines. An association consisting of 3,000 colleges, CHEA is the largest accreditation advocacy group in the country. The organization provides the public with information about accreditation and CHEA maintains an extensive database of recognized accrediting organizations around the world, as well as a list of accredited schools and programs located in the United States. Qualified legal professionals are in constant demand, and their job outlook is largely unaffected by economic activity. For this reason, legal careers are considered 'recession-proof'. However, lower-than-average job growth is expected in legal professions. According to the Bureau of Labor Statistics (BLS), legal occupations as a whole are expected to grow by 5% between 2014 and 2024, resulting in the creation of roughly 64,600 new jobs. The table below breaks down the 10-year industry growth outlook for some of the most common legal professions. Unemployment projections for bachelor's in legal studies recipients are fairly strong. Paralegals, for example, face an unemployment rate of 2.8%. Unemployment rates for jobs in law enforcement are also strong; patrol officers face an unemployment rate of 1.0%, while forensic technicians face an unemployment rate of 3.1%. By comparison, the average unemployment rate for all occupations nationwide is currently set at 4.5%. According to the 2016-17 PayScale College Salary Report, students who earn a bachelor's in legal studies earn median annual salaries of $40,200 during the first five years in the workforce and $57,800 after 10 years on the job. However, salary expectations for employees with a bachelor's degree in legal studies will largely depend on their specific job title. Other important factors include experience level, employer size, and city/state of employment. The next table looks at 20-year salary growth projections for five common career pathways among legal studies bachelor's degree-holders. All five occupations experience salary growth of at least 37% after 20 years on the job. Court reporters have the highest growth rate: a 57.9% increase in earnings between the entry-level and late-career stages. Legal assistants rank second with 44.4% salary growth, followed by paralegals with 41.8% growth. Those who graduate with a bachelor's in legal studies online will be qualified for dozens of entry-level jobs in legal, law enforcement, and other industry areas. Four of the most popular occupations for legal studies degree recipients are outlined below. Paralegals and Legal Assistants: Paralegals and legal assistants perform supportive tasks on behalf of licensed attorneys. Their regular responsibilities include organizing files, drafting legal briefs, prepping lawyers for trial appearances, and researching legal history and case studies. The BLS notes that 72% of paralegals and legal assistants are employed at private law offices. Court Reporters: Court reporters are responsible for recording trials, depositions and other official courtroom dealings. They must transcribe the proceedings word-for-word, and may also provide captioning for televised broadcasts or translations for non-English-speakers or people with visual or hearing impairments. Arbitrators, Mediators, and Conciliators: These three occupations are designed to provide third-party support during legal disputes. Arbitrators hear testimony and make decisions regarding legal disputes. Mediators hear disputes, but do not make decisions involving the parties. Conciliators provide a similar service as mediators, only they meet each party separately, rather than simultaneously. Legal Secretaries: Like paralegals and legal assistants, legal secretaries specialize in performing supportive work for licensed attorneys. In addition to performing legal research in order to prep lawyers for trials and depositions, they also draft legal documents like subpoenas, summonses, complaints, and motions. Making professional connections and learning about different approaches to legal studies is crucial to your success. Professional organizations offer a great entry point for students who want to learn more about their chosen career path. Below you'll find three of the country's most prominent organizations established for legal professionals. These organizations host networking events, provide online trainings, maintain active job boards, and offer other services for career-ready college graduates. Resources like these often prove invaluable as you complete your degree requirements and prepare to enter the job market. National Federation of Paralegal Associations: Founded in 1974 following a merger of eight paralegal associations, this nonprofit currently represents 55 associations nationwide and more than 9,000 members. The NFPA strives to implement state-by-state standards for paralegal professionals and monitor activities to ensure legal and ethical practices. National Association for Legal Assistants: With more than 18,000 members nationwide, the NALA is the leading professional organization for paralegals and legal assistants in the United States. Certification programs are offered to members; the website also features an online career center, continuing ed webinars and back issues of the Facts & Findings peer-reviewed journal. American Alliance of Paralegals, Inc.: The American Alliance was founded in 2003 to "advance the paralegal profession by focusing on the individual paralegal". The organization offers the American Alliance Certified Paralegal (AACP) credential; members also receive a complimentary subscription of the Alliance Echo magazine. Students who pursue online degrees will be eligible for scholarships, grants and other financial aid that is unavailable to their brick-and-mortar counterparts. Learn more about these financial opportunities for web-based learners. Our page dedicated to resources for business students includes links to professional organizations, open courseware, industry publications, books and business-minded users to follow on Twitter.